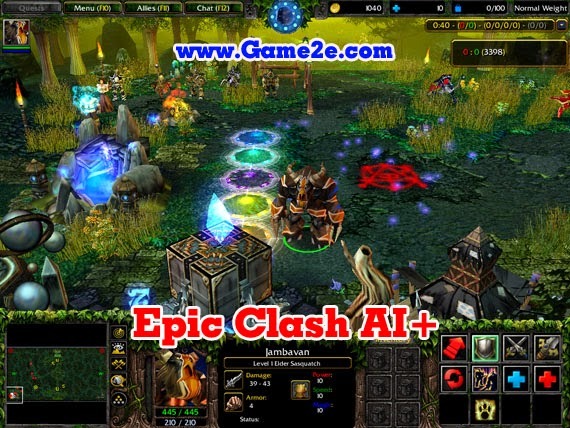 - Epic Clash is an epic battle between Heroes. Destroy and kill every opponent and become the best warrior! Most heroes here are inspire by Warcraft III. - all skills have elements. Different element deals different elemental damage. - can show how much damage is dealt to the target. Damage dealt via spells varies and does not deal the same damage every time. - Epic Clash has it's own attribute system. You can manage you own build of Hero. - certain equipments have weight. Hero can become overweight and will slow the hero's move and attack speed. Weight is also for potions, so that they won't bring too many. - mostly inspired by DotA's kills system. - enables you to build/combine items for better items. Mostly inspired by DotA's recipe system. - can buy items/pick items even if inventory is full. You cannot pick the item if the item is not yours. - powerful items have limits of how much you can carry. - enables a random weather in the map. Weather have impact on units specially the storm weather.